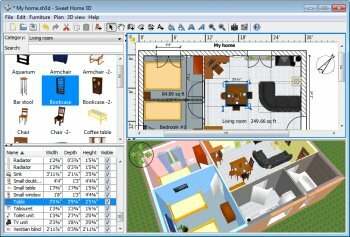 Sweet Home 3D is a free interior design application that helps you place your furniture on a house 2D plan, with a 3D preview. This program is aimed at people who want to design their interior quickly, whether they are moving or they just want to redesign their existing home. Numerous visual guides help you draw the plan of your home and layout furniture. You may draw the walls of your rooms upon the image of an existing plan, and then, drag and drop furniture onto the plan from a catalog organized by categories. 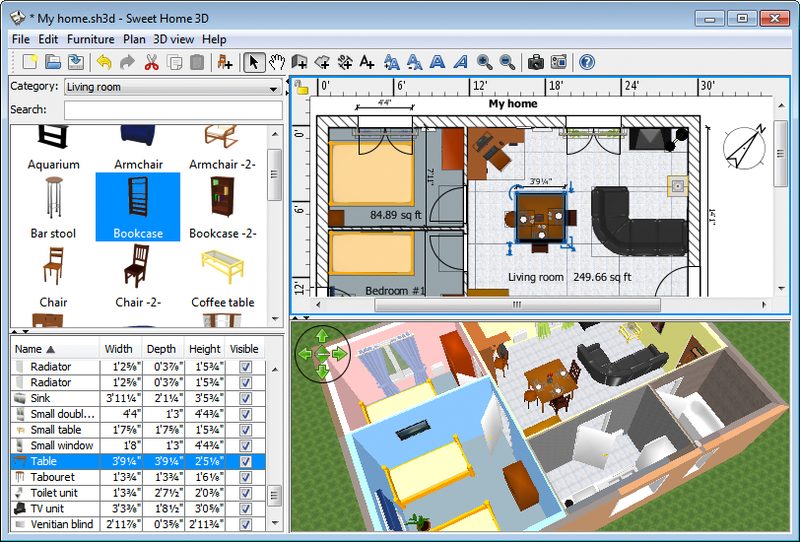 Each change in the 2D plan is simultaneously updated in the 3D view, to show you a realistic rendering of your layout. Excellent app regardless of the language used to wrtie it. @those bashing the use of Java, what alternative do you have to implement this in Linux (32 & 64 bit), Windows, MacOS and any other platform in which Java runs? Mono's .NET support comes up a little bit short. That a program of this quality is out there at all on all those platforms is a nod in Java's favor and a nod to the developer for his foresight. A GUI-based application such as this does not need to be time-critical so a post-compiled language like java is just fine for it. About Java, what do you have against it ? If you want to see a beautiful interface, take a look at JSoko. And there's no point arguing about Java, anymore. Sure it's a technology who's day never came; yes it's pretty slow; the Java plugin is a major cause of browser crashes, etc. etc. But this app works extremely well and it's free. Java is crap for anything which uses a GUI. It is only usable for business apps unsing Java EE. SH3D itself is a (maybe the only one) real "(no IDE) application" which is written in Java and works fine. I never saw a Java app which runs flawless like a native compiled one. Also in SH3D you can detect Java issues sometimes. But performace is okay for use. Don't listen to the person who is thrashing Java. It's actually one of the better write-once run-anywhere technologies. I find the 3d rendering part has a lot of potential. It's using OpenGL which is the only cross-platform graphics API. For a free program, this is a pearl. Don't object Java, it's useful and not such a big deal as the previous poster thinks it is. He should get off his lazy a** (figure of speech) and just download+install it. Great looking program... but... I refuse to put Java on my PC. Java is bug ridden, slow and a security risk. Sadly, many people think that just because it is platform independent that it is the bees knees, well it's not, and I wish developers would stop using it. No matter what they say, the best programs are written as native compiled ones. I just tried the online version and I can tell you that, as a former draftsman that this program is extremely easy to use. Just perfect for Mr. Anybody or even Mrs. Anybody wanting to create a plan of their living space or what ever without having to take a course in drafting! More fabrics and wall textures? Maybe but, hey, it's free and I suspect it's more than enough for most people. Edit= http://sweethome3d.sourc...e.net/importModels.html leads to all the models that can be used in the program but also has links to other websites that have models for it.